Posted on March 14, 2012, 11:53 am, by Thomas Hawk, under LowePro. About 7 years ago I bought my first speciality camera bag. I’d been using a regular backpack to lug my stuff around, but I needed something more targeted for camera gear and so I bought the LowePro CompuDaypack . It was an excellent lightweight bag that was perfect for carrying around my camera, a few lenses and my laptop computer. 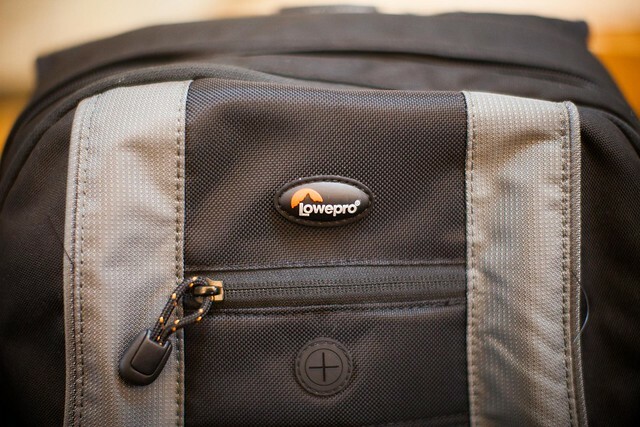 One of the reasons why I bought the bag from LowePro was because it had a lifetime guarantee. If something has a lifetime guarantee, the quality should be pretty high (assuming that they honor the guarantee). Over the course of the next 5 years or so I wouldn’t say I abused that bag, but I wore it every single day of my life. It went into abandoned buildings, over fences, through broken windows, up on bridges and roofs and on tons of trips — it went through rain, sleet, snow, deserts, mountains, beaches, everywhere. I’m not your typical weekend shooter and so I’m not sure that any bag could possibly withstand the sort of turmoil I put a bag through. Inevitably the bag began to wear out. When you use a bag like I do this will probably happen to any bag. The fabric literally began to tear apart at the bottom of the bag where I’d set it on the ground over and over and over again. I loved my LowePro though. It was perfect for me. I liked it so much that I bought another LowePro as my next bag purchase. This time a bigger bag to accomodate even more lenses, the CompuTrekker Plus AW. I had more to carry around and needed something even more robust for my photography adventures. Probably the biggest vulnerability on any bag is the zipper. After about 2 years, the zipper on my CompuTrekker Plus AW went out. Disappointed, I decided to send my bag back into LowePro to see if it could be repaired. Since I was mailing them my new backpack anyways, I thought I’d also through my old CompuDayPack bag in as well and see how well LowePro honored their lifetime guarantee on their bags. To my surprise after sending both bags into LowePro they sent me back two brand new bags. I don’t think they make the CompuTrekker Plus AW anymore so instead they replaced it with one of the best bags that they make, the Lowepro Pro Runner 450 AW . They also sent me a brand new CompuDaypack . When a company stands behind their products and honors their lifetime guarantee like this, I think it’s only fair to write up a blog post on them as a satisfied customer and share an example of excellent customer support with the rest of the world. Not only does LowePro make great camera bags, but they stand by their product even when someone puts it through the sort of workout that I do.